Let's see if I can figure this one out!! And yes I can! Thanks to the wonderful Terry at the the gardening group I belong to, this is now identified: a Chinese Elm, also known as an Evergreen Elm. Ulmus parvifolia (UL-mus par-vih-FOLE-ee-uh.) AND...these little flower/seed things are EDIBLE. The are called samaras (samara if singular). They only exist for a couple weeks, blooming usually in the beginning of October, but here it's still the end of September, which is not surprising - we always have things a bit wonky. The two week issue could be why I've never seen them before. And the new leaves are edible, too, which means in the spring AND a little right now, there will be some greens I can have. Yee ha. Here's the bark. 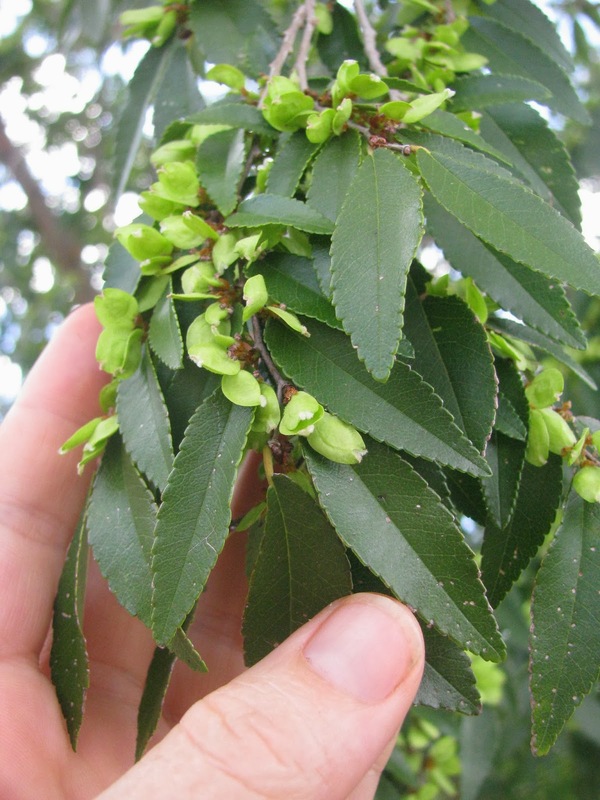 For a Siberian Elm, which has very similar flowers/seeds (also edible), the bark looks much more like a regular tree. But for the Chinese Elm, the bark naturally comes off in these little bits that look a bit like a jigsaw puzzle.